Accordingly, they felt it was critical to their chances of survival to reach their cabins in order to get a life jacket and to then fight their way to an outside deck. As they headed towards their cabins, the ship began to tilt even further, causing the very real fear that they did not have much time. Accordingly, they continued to fight their way through the stream of screaming, running and panicked passengers. As all of this was going on, there were no announcements whatsoever made by the ship, nor any assistance or direction provided by the crew other than for passengers to return to the dining room. Instead, there was simply mass panic amplified by the lack of training and incompetence of the crew. 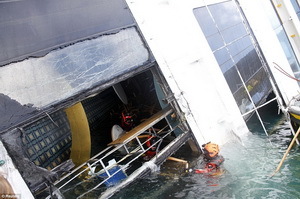 As the group of friends ran up the stairs towards their cabins on deck 9, they stopped on several occasions to ask crew members where they should go to find the lifeboats after getting their life preservers. Most of the panicked crew members simply ran by them without stopping to answer questions or offer assistance. Eventually, one of them stopped and said that there was “no problem” and that they did not need to go to the lifeboats. They continued to run up the stairs, when all of a sudden, the lights went out and they were in pitch darkness. There was no emergency lighting, just absolute darkness. It was so dark that they could not even see their hands in front of their faces. Stranded in the darkness on the stairs, with the ship tilting into the water and the panicked crew refusing to help, they were convinced they were going to die on the ship, trapped alone in the dark, waiting for the water to overtake them. Eventually, some emergency lights came back on, however, they were insufficient to assist passengers in finding their way through the ship. As a result, the group abandoned all hope of going back to their rooms, afraid of being caught in the dark again. So they began to go down the stairs in search of the lifeboats. In the process, they stopped another crew member running by to ask where the lifeboats were, however, he would not tell them or the other passengers and instead represented that everything was “fine” and that they should go to their rooms. Eventually, they grabbed a crew member’s arm and demanded that he tell them where to go in an emergency, literally forcing the information out of him. It was only in this manner, that they found out that the lifeboats were on the fourth deck. Accordingly, they immediately retreated down the stairs and headed towards the high side of the ship, coming out on the deck next to the lifeboats. There, they found a few remaining life jackets from adjacent lockers. It was at this point that the group first realized that they were only three and that one of them was missing. During this time the lone friend had eventually made her way to her cabin. Since she had never been on a cruise before, she had no idea what to do because of the lack of help from the panicked crew members. She sat in terror in her room for over an hour anxiously awaiting for some type of announcement or assistance. Since she had an interior cabin, her room was pitch dark and she felt helpless and terrified. When the ship finally began to make announcements, they untruthfully indicated that all was well and that there was no problem. Eventually, as the ship began to list even more and the din outside became overwhelming, she realized that the announcements were an outright lie. Accordingly, she left her cabin to find the lifeboats. The list was so bad that she could only work her way slowly to the lifeboats, which she had to find herself because of the lack of help by the crew. As they waited at the lifeboats, our group of three friends repeatedly asked the crew standing there what was happening. The crew just shook their heads as if they didn’t understand English. While at the lifeboats, announcements were being made by someone other than the Captain that the ship was just suffering an electrical problem and that everyone should go to their rooms, since there was no emergency. Based upon their experiences at this point, our clients did not believe the announcements and could not understand how an electrical problem could cause a ship to list so badly. They also wondered why the Captain was missing in action. Accordingly, they remained at the lifeboats, shaking uncontrollably from fear and cold. After a while, the list on the ship began to lessen and they began to hope that things were coming under control. The announcements continued advising the passengers that nothing was wrong and that they should return to their rooms. Nevertheless, the lights went out on at least one more occasion, and as a result, they did not want to leave the deck. Suddenly, the ship began to tilt again, this time in the other direction and at a much faster and more severe rate. The tilt was so dramatic that the view from the deck dramatically changed from the sky to just water as it got closer and closer to the ocean. As they became more and more convinced that matters were out of control, no announcements or alarms were sounded. Therefore, they continued to hold on and wait. As the water became closer and closer to the deck where they were standing, they began to debate whether they should try to head to the other side, because they could not understand why the crew wasn’t loading the lifeboats. They became terrified that the crew was going to wait until it was too late and that the ship was going to sink completely underwater. They began to discuss what to do in the case of having to jump, because they had lost any faith at this point that the crew would evacuate passengers. Eventually, the alarm finally sounded indicating that the Captain had given the abandon ship order and that the passengers were to go to the muster stations. Shortly thereafter, a female crew member approached the group and inconceivably asked them to leave the lifeboats despite the abandon ship alarm and to instead go to the interior of the ship to wait in the theater, so they could “balance the boat.” As a passenger videotaped her making the speech, she became very angry. As a result of the total incompetence of the crew and their lack of control over the situation, our clients decided to remain by the lifeboats, afraid of being trapped inside in the dark of what appeared to be a sinking ship. The deck quickly became overwhelmed with frightened passengers waiting by the boats. Crew members asked the passengers where their muster stations were, apparently oblivious to the fact that the passengers had no idea, since there had never been a muster drill. Finally, the passengers just loaded into any boat, in a haphazard fashion. As a result, the boats were packed in excess with some passengers sitting in the seats, others on the floor or crammed in any other available space. Although the crew tried to count the passengers, because of the complete lack of organization and panic, people kept pushing on to the boats. 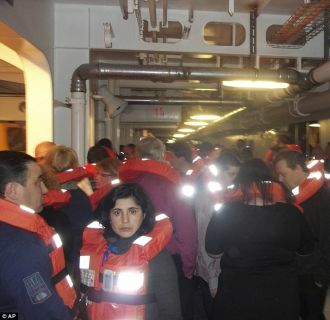 Passengers were seen pushing on to boats even after crew members told them there was no room, forcing their way aboard and refusing to leave. When the boat that our group of three friends finally began to be lowered to the water, they could still see people running back and forth on the deck looking for an open boat, crying and terrified. The lone friend miraculously crammed her way into another lifeboat that was so full of panicked passengers it had a difficult time getting to the island as the occupants were convinced it was going to sink. Eventually, the group reunified on the island, thankful that they had escaped certain death.